The addition of Bunga Telang allows the drink to change colours! In a saucepan, add in 1 cup of water, 2 cups of sugar and lemongrass. Stir the mixture gently until most of the sugar has dissolved on low heat. Mix 50 ml of hot water and blue pea flower and steep for 15 minutes to get an intense blue colour, remove the flowers and set aside to chill. 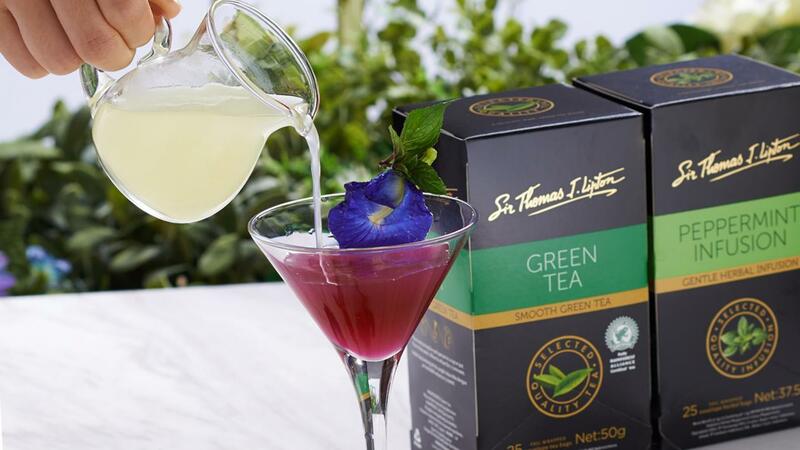 Boil 150 ml water and steep Sir Thomas Lipton Green Tea and Sir Thomas Lipton Peppermint Infusion for 4 minutes, remove tea bags and chill in the refrigerator. Just before serving, mix the tea and blue pea flower water together. Serve on a Martini glasses with the lime lemongrass syrup on the side. The colour will change when the syrup is added.